This post covers so much, it's supercalifragilisticexpialidocious! I've been thinking how great it would be to have a home exchange website for gardeners who like to travel but are on a limited budget (such as... looks around, whistles nonchalantly, drums fingers... say, me). I've even offered a bedroom in my modest home for anyone visiting Ann Arbor (see earlier post) who doesn't want to shell out for a hotel room. Plus, local gardeners could show visiting gardeners around, give them a tour of their own garden, and chat about all the things we blog about! As a single traveler, I'm especially open to this idea. I've checked out a ton of home exchange sites, but they all seem to be people with jet-set lifestyles and amenities. Finally I came across the Couch Surfing Project, which is more my speed. 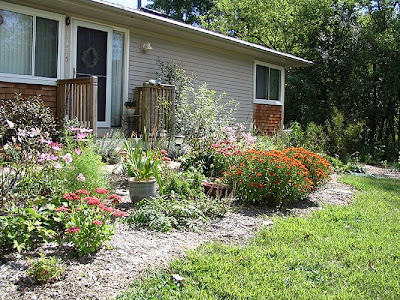 My profile is here and that's my house above with a fall garden two years back. I think it would be cool if more gardeners signed up! :) Hint hint hint. And if any of you plan to be in the Ann Arbor, contact me ahead of time to see if space is available (regardless of whether you register at couchsurfing.com)! A year or so back, I gave a talk on winter seed sowing for the Isabella County master gardeners in Mt. Pleasant, Michigan (two hours northwest of Ann Arbor). 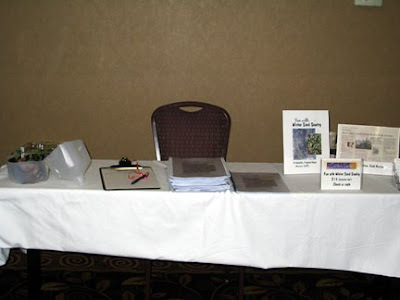 They offered me a free vendor table at the conference this year, which I gladly accepted as a way to step out of my comfort zone and try my hand at selling my book, Fun with Winter Seed Sowing, in person without also presenting. I've never been a vendor before. My table was in the same room as the speakers, not in the side room with all the real vendors. This had the advantage that I could see/hear the speakers, which the other vendors could not. But I believe more traffic existed in the actual vendor area. No matter, I met my objective of being a chatty salesperson (did I mention this was outside my comfort zone?) and sold a few books. Imagine me sitting in the chair instead of behind the camera and you get the idea! Books in middle, signs to the right, winter-sown samples to the left. Last week, I taught a composting class at Washtenaw Community College. 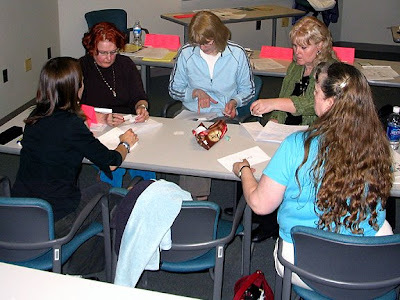 I devised a game for the class where I divided the class into small groups. Each group had maybe 30 small cards onto which I'd written things like "coffee grounds," "rabbit doo doo," "egg shells," and "meat scraps." Based on what I had just covered, and a little extrapolation, they had to decide whether what was written on the card was green (nitrogen-heavy), brown (carbon-heavy), or not compostable and place that card into an appropriately labeled envelope. I wasn't sure if they would enjoy this, but I figured it would be fun, and based on their feedback, it was! The Dove chocolate was meant to be an incentive but it melted in the car and was instead a blob! Some time ago, Garden Girl bestowed me with a blog excellence award. Who me? Blush. I'd like to thank the academy... or at least Garden Girl! The award is technically a meme in that if you accept it, you're supposed to pass it on to/tag 10 others who need to pass it on to 10 others who... Garden Girl says she's not so into rules, and I see her point. I'm not one for pyramid schemes. I do however believe in passing on praise, so I would like to mention some blogs I enjoy reading, and to whom I would make the award. You'll excuse me in that they're not all garden-related. I really enjoy Precarious Tomato's blog, which I came across randomly. I enjoy her offbeat sense of humor and practical life approach. She'd be able to write several paragraphs about how, say, she wore her shirt backwards (which, um, yeah, hi, I managed to do today) that would have you rolling with laughter. I check in from time to time at Inhabitat, which is all about design with an eco bent. I really dig the wonderful news and photos this site's many authors convey. Admittedly, the cutting edge, extra hip feel of the site sometimes makes me feel decidedly poor and UNhip, but I do enjoy the info there. I also stumbled upon Christine Kane's blog. She's a singer and songwriter, whose music I don't follow, but who also talks about pursuing your dreams and aligning your purpose with your life's work (which I really dig). Plus, she makes up whole life stories and scenarios for her cats, which, well, yeah, I thought I was alone in! And now for fun garden blogs, with a huge caveat: I'm still getting used to organizing blogs in Blotanical and never seem to be able to spend as much time reading these wonderful sites as I'd like to! Plus, I'm always amazed at the quantity and quality of blog postings with such great photos and information. There's so much to read and it's quite hard to narrow down favorites. I enjoy A Wildlife Gardener's beautiful photo essays in Our Little Corner of Paradise. I also love wildlife and I've always been a bit of an Anglophile, so this blog fits right in. I always feel like I'm transported to her backyard. Wildie, do you watch Corrie (and yes, I know Manchester isn't in Scotland!)? Americans never know what I'm on about! Frances at Faire Garden also posts frequent and beautiful photos of wonderful blooms in her Tennessee garden, and she's been a friendly and frequent commenter in my own blog. Her garden looks so inviting! Garden Wise Guy in Santa Barbara offers fun anecdotes, gardening and otherwise. It's also really interesting to learn about gardening in a zone so different to my own, in terms of temperature and humidity! Golden Age Gardens posts frequent photos and info about Victorian gardens, a particular interest of mine, especially those in England, his home country. It's fun to go back in history, right from my computer chair, at his blog. Yolanda Elizabet's Bliss is another site with lots of great photos. She's in Holland, another favorite place of mine, and she also likes cats. What more is there to say?! Bek's Augenblicke im Garten offers a great selection of garden stories and photos, in German and English. She has a second site that compares life in the US and Austria, which is of particular interest to me, as my dad was Austrian. Plus, it's nice to learn German names of plants. I also enjoy a few other German garden bloggers, such as Sabine's Creekside Gardens and Wurzerl's Garten-Impressionen. Finally, back to where we started, I like Garden Girl's blog, and I don't even hold the fact that she's so near the Chicago Botanic Garden against her. Much. ;-) She posts nice photos and interesting stories. You're kidding right? You want to read yet more? I'm surprised you even made it down this far. Aren't you tired? I admit I am, so my photos and recap shall have to wait a bit longer. Oh, all right then. Here's one photo to tide you over. 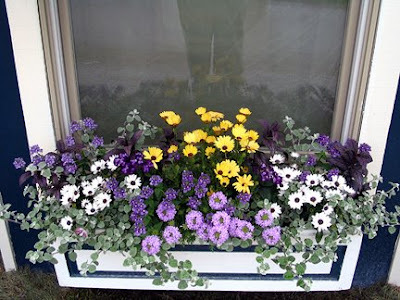 A happy, cute, and friendly window box display. I love the colors! I was already given this award on the 3rd March this year by my friend, Shirl, at shirlsgardenwatch. In turn I nominated just one person called Cheryl from mygardensanctuary. The reason I nominated only one is that so many of the garden blogs I visit had already been nominated so I figured I'd try only one person...and it worked. Monica, thank you for passing the award back to me. I hope you'll forgive me if I don't do another E award post - real gardening has seriously cut into my blogging time, and that's a lengthy post to write, and lots of messages to send. There are certainly many other blogs worthy of the award though. Congratulations on writing a book, and on your articles. I read the rain garden article and checked out the link for your book. Very nice! Garden Girl, Good Lordy no, please don't start the cycle all over again! ;-) As I said, I'm not wild about the "snowball" effect, but I just wanted to call out blogs I enjoy reading. Wildie, Sorry I did not read far back enough in your blog to know you were already awarded. (And see above for my feelings on memes). And I just realized I forgot to mention toads in my most recent entry, which I've now updated and which may be of interest to you! Home exchange is a great idea for gardeners as, if you arrange a swap with another keen gardener you can go away knowing that your plants will be lovingly cared for while your exchange guests are in your home. Gardening exchange partners will also be delighted to direct you to nearby open gardens, nurseries and parks. An exchange service specifically for gardeners could be a good idea (although it would be very much a niche within a small niche in the travel business so would take time to develop to provide much choice). I'm sorry to hear you have been put off by the standard of homes on general home exchange sites. I hope you will have a look around my site, Home Base Holidays (based in London, England and running since 1985). Yes, there are some spectacular homes but, if you look you will see that the majority of homes are more modest. Location is the most important factor for most home swappers and most aren't bothered if the home they exchange to is not as grand as their own. Check out my home exchange blog for more information. Thanks very much for the award. It's always nice to receive such a lovely compliment. Congrats on writing your book. I've written one too and know what hard work it is! BTW love that window box, such a lovely combination of plants. Delightful window box color scheme. I love the play of purples and blues against the yellow and gray. Have you used Helichrysum this way before? If so, how do you keep it from becoming the monster it is genetically predisposed to become? In the ground, they get 6 feet tall by 15 feet across. Inquiring minds want to know!